The Ram Recruiting Report: Pierria Henry Commits to VCU! The Rams have secured a HUGE commitment from 6’4, 186 pound combo guard Pierria Henry (incorrectly listed as Perry Henry on several sites) out of South Charleston high school in West Virginia. He is a Big East level player who sported a number of Division 1 offers including West Virginia, Virginia Tech, and Xavier among others. ESPN gives Henry at a 92 grade which would make him the highest-ranked recruit according to that service that VCU has garnered a commitment from since ESPN started their recruiting service. He was a two-sport standout for the Black Eagles starring at wide receiver and defensive back in football. Henry led them to 2 straight state championships in the sport and was named MVP in the state championship game this year . He’s no slouch on the basketball court either, scoring his 1000th point as a junior on February 11th. He was named Mountain State Athletic co-Player of the Year (with Wake Forest commit Chase Fischer) and 1st team All-State West Virginia. He was recently named MVP of the All-Ohio Nike Cup AAU tournament, leading his WV Wildcats 17U team to the title with 21 point, 9 rebound game in the final. Henry can do it all averaging 16.2 points, 8 boards, 6 assists, and 5 steals per game this past season. Rivals Profile: 3 stars, offers from West Virginia, Xavier, Virginia Tech, VCU, Marshall, Ohio, Akron, Cleveland State, and Delaware. ESPN Profile: 92 grade, considering Akron, Marshall, West Virgina, Xavier, and Virginia Tech. Scout profile: unrated, offers from West Virginia, Xavier, Akron, and Marshall. What makes his achievements in both sports all the more impressive is the fact that he comes from a tough family situation and despite his hardships has thrived. His father left him and his 4 siblings when he was just a child, leaving his mother working 2 jobs to keep the household afloat. His brother is sitting in a jail cell for allegedly shooting a man and Henry has had to grow up quickly and become the man of the house for his sisters. Things got so bad at home that his mother finally relented and let him go live with his girlfriend’s family to get him out of the negative environment surrounding his home. Without the money to pay for college, Henry’s flair for the athletic opened new doors towards completing a college education. The hardship of his life has given him toughness, heart, and desire that can’t be learned on the basketball court or the turf. He is one the hardest working players on the football field and was the leading rebounder on his team as a 6’4 sophomore guard. Henry’s hard work is not just limited to the athletic arena, as he also sports a GPA above 3.0 as well. While he’s a great player on the court, Henry looks to be an even more remarkable individual off of it. An unfortunate injury during the AAU season sidelined Henry as he developed a blood clot in his right leg after being kneed in the thigh at the Pittsburgh JamFest AAU tournament at the University of Pittsburgh. It was the second injury after developing a deep thigh bruise in the Nike Cup tournament in Columbus the week before. The blood clot required immediate emergency surgery and so he underwent a number of surgeries to take care of it. While he is expected to make a full recovery, the timetable for recovery from such an event is anywhere from 3-6 months. This means that Henry will be unable to play in both AAU tournaments this summer and football in the fall. While Henry is a division 1 football prospect, he had not received any firm offers although many coaches were looking at him at the wide receiver position. With his recovery time impeding him from playing football this fall, basketball is the way to go for Henry. Is anyone else thinking Jesse Pellot-Rosa here? Henry has all the makings of a tough, hard-nosed guard who can put up points in a hurry but also battle among the trees in the post to grab valuable rebounds. With offers from VCU, West Virginia, Xavier, Virginia Tech, Akron, Ohio, Cleveland State, and Delaware, Henry has been recruited by a wide variety of schools and ended up choosing the Rams. His ultimate goal is to go to the NBA in order to provide for the family and mother that have worked so hard their whole lives to get by: "That's why I keep working hard every day to get to the pros. That's my main thing; get my mom a nice home and a car that will work. Let her sit down and relax and enjoy life. Right now, she can't do that. She's been working ever since I can remember." Sound like a good kid to you? South Charleston AD Jason Redman agrees: "For him to go through the things that he's gone through and be the quality kid that he is ... Let's put it this way: I have a two-month old son, and I hope he grows up to be that kind of quality person." While it sounds like Shaka Smart and the rest of the VCU coaching staff have picked up a heck of a basketball player, it also looks like they’ve picked up an even more impressive individual in the process. 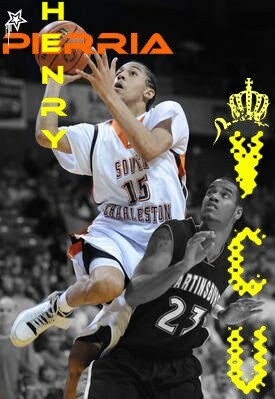 Henry joins 6’7 forward Kasey Wilson as the 2nd VCU commitment in the 2011 class. There are 2 spots remaining. I think I speak for all of Ram Nation when I say, "Welcome to VCU, Pierria Henry!" Is there anyway you could set up a email subscription for the blog! i'm loving this but sometimes it's hard to remember to check the site and email would be easier for me to stay tuned! Thanks!